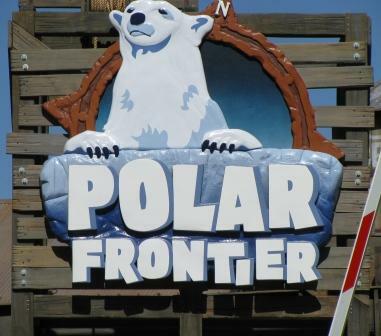 Shortly after the new Polar Frontier area of the Columbus Zoo and Aquarium opened recently, our family headed over to the zoo to take in the new addition. We arrived towards the end of the day (to avoid the many school field trips this time of year) to see the new exhibit. From the front gate, our littlest one had fun trying to hop on the “bear tracks” or paw print stickers that the Zoo has placed on the ground to help visitors find the exhibit. 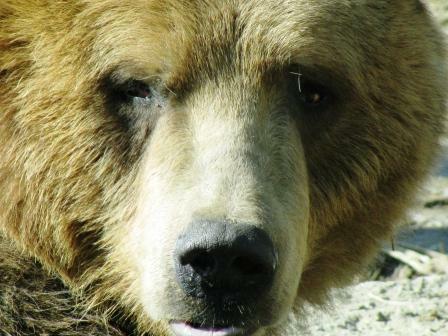 The bears live in the North America area, up the hill past the Habitat Hollow, Pony Rides and Train. If you are visiting with little ones (or someone who might need help walking), be sure to bring the stroller or wheelchair: the exhibit is at the top of the hill. Meandering back through the tree covered pathway, the path opens up to the Polar Frontier area. There are two main exhibit areas that house the Black Bears and Polar Bears. The education building has fun interactive learning centers and an “ice” sculpture for the kids to explore. Our favorite part of the Brown Bear exhibit was the “sniff” center where you can sniff the bears and they can sniff you through an air exchange hole. Our daughter declared the bears to be “forest stinky.” (Not quite sure what that means but I’d love to hear what you think the smell consists of!) Be sure to look for the piece of iron that the bears bent while in their old enclosure. I definitely don’t want a bear hug from these two guys! To follow the adventures of this entertaining duo on the days when you are NOT visiting the zoo, you can follow Brutus on Twitter. 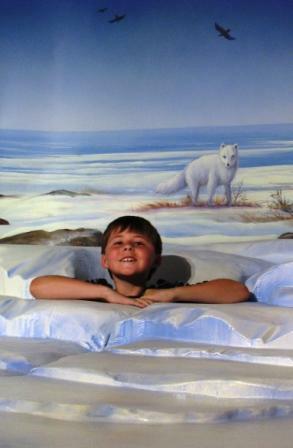 The Polar Bear exhibit was amazing in that you can view the bears from all different angles. Above "sea level," you can frequently see the sisters sunning themselves on the rocks. Travel down the ramp, underground, and you can view the bears swimming in the water. The trout swimming in both exhibits are edible, but so far the Polar Bear girls are more adept at catching them than the brown bears! Brutus and Buckeye don’t like to swim in deep water and those smart trout have figured out how to dive deep when the bears are in the water.